We all agree that QR Codes are an incredibly useful tool for advertising your product/company/brand in a creative manner (you can read more about what are QR Codes) but their appearance leaves much to be desired. Like other barcodes, the QR Code comes in only black and white and is comprised of an unappealing cluster of dots that are arranged in a square pattern. On the products that are sold in the supermarket it can be useful to have an easily recognizable code, especially when that area is hidden in the back, but when the code is displayed in the middle of your advertisement, the effect is unattractive and often distorts the design and symmetry of the rest of the image. 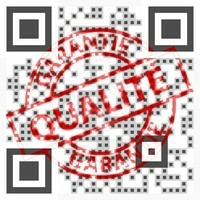 The problem is that the QR Code can’t be hidden in a small corner of the image if we want to achieve our desired goal. On the contrary, QR Codes are often placed in a very prominent area in the advertisement because they must be conspicuous enough for customers to notice them and decide to scan them. So there are two contradictory requirements – to have your QR Code be as noticeable as possible in order to attract customers to scan it without compromising on the composition and beauty of your image. Seems impossible? It’s not! All you have to do is transform your QR Code into a Visual QR Code – simply the next step in the natural evolution of QR Codes. When the QR Code is merged within an image, it still retains its distinct, code-like appearance so that it is obvious that it is a QR Code its purpose is to be scanned, but it is now represented within a colorful, attractive picture so that instead of marring the overall image, it can blend in naturally with the rest of the design. Essentially, using a Visual QR Code translates as transforming part of your picture into an interactive, animated design that when scanned by a Smartphone, will redirect it to the location as defined by the QR Code. In the market today, there are millions of options and the competition is cutthroat. Distinguishing your brand from your competitors is critical so that it will be memorable and striking in the eyes of the customers. Using Visual QR Codes is an excellent way to elevate yourself and your brand from the masses of black and white squares and rise up to a new level of distinctive, unique attractiveness, without compromising on creativity or the usage of cutting-edge technology. Use your Visual QR Code to design an innovative and unforgettable statement that will symbolize yourself and/or your company in your customer’s eyes and increase their affinity to your brand and your product. With the use of Visualead’s technology, you can create your Visual QR Code in 3 easy steps. All you have to do is choose an image, either from our extensive image gallery or an image of your own (such as your company’s brand or logo), set your QR Code’s desired destination (webpage, map location, contact in an address book, ect.) and Visualead’s QR Code Generator will merge the QR Code into the image in an instant. The process is quick and requires no effort on your part but has the potential to revolutionize your product and raise your company to the next level of success. For more on why to use Visual QR Codes and more importantly, what you can do with QR Codes.